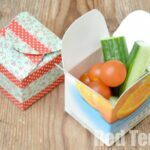 Today, we would like to show you how easy and simple it is to turn a plastic milk jug (or juice carton) into a cute little woven basket craft (which I think makes a great DIY Gift Box Craft).. 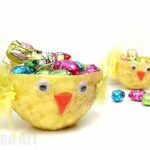 This little upcycled basket is perfect to fill with goodies on Mother’s Day or to let the kids use as an Easter Basket.. or make it “simply because” you want to. 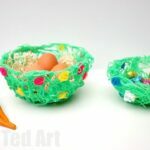 The milk carton basket is also a great way to introduce children to weaving – as the kids practice the principles of creating a woven pattern. Lovely! 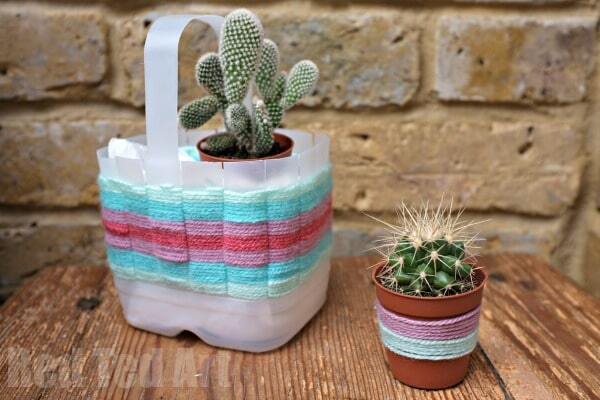 So.. are you keen to make one of these woven baskets? 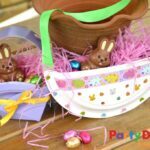 Check out our step by step guide to how to make the basket!!! 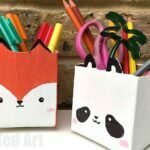 *don’t worry about the size of your milk carton – needless to say, the bigger the bigger your baskets. But all baskets look lovely regardless of size! 1) Begin by cutting your milk carton in half. NOTE: I left a little rim – that I could use later as a handle, so before you cut – think about which parts you may or may not need again later. 2) Cut Strips down the side of the milk carton. NOTE: you need an UNEVEN number of strips if you want to keep going round and round. 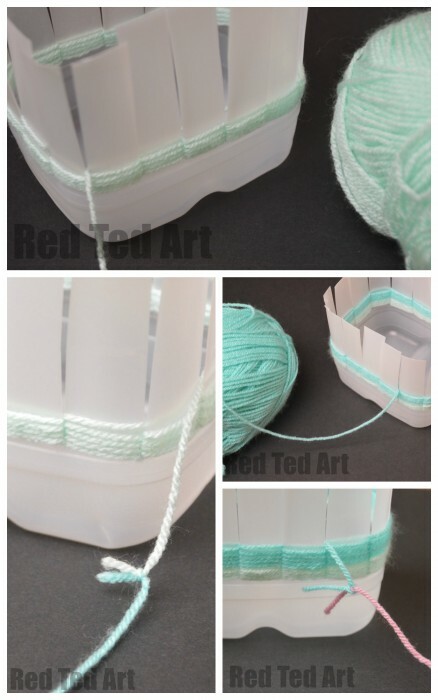 If you have an even number, your basket will also look nice, but you will end up alternating “a white plastic strip” and a woven bit (if that makes sense). It is just a matter of choice. 3) Tie a knit into your wool to secure it and start weaving in and out. I started it off to make it easier for the kids. 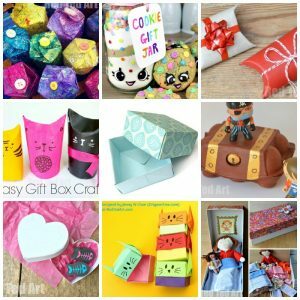 Nothing quite like crafting in your PJs! Red Ted did find the weaving tricky, but got the hang of it. 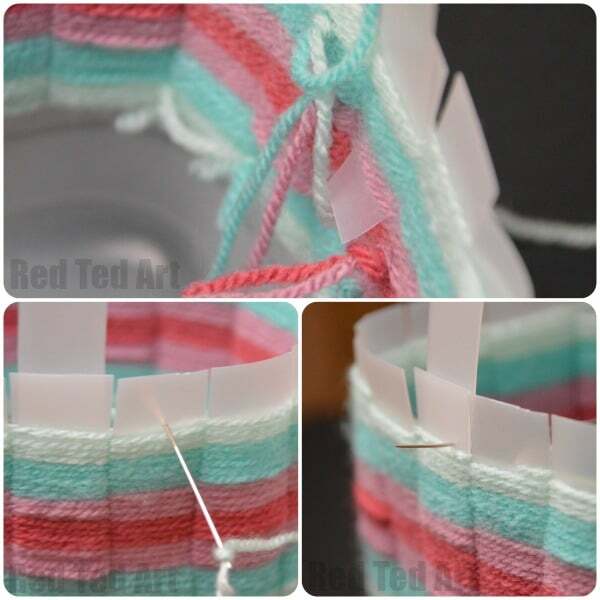 To change colour in your woven basket craft – simply knot the two pieces of wool together. Try and knot them in such a way, that when you start weaving, the knot is on the inside of your basket. 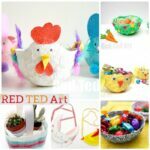 Continue your woven baskets and change the colours as and when you wish too! Time to add a handle. 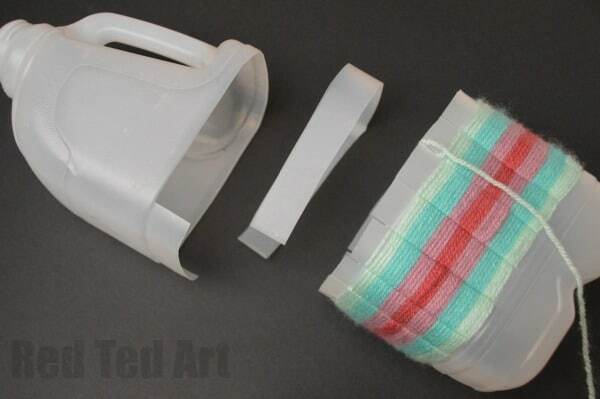 Cut a strip of the remaining milk carton jug as per the picture. We then slid the handle in between the woven wool and with a needle secured it in place. 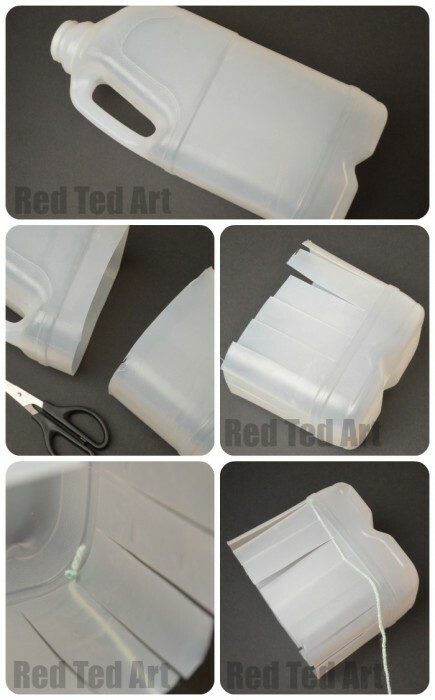 Now this bit IS a bit tricky, as the plastic can be very stiff. If you find it easier, you can staple the handle in place too. And your upcycled Woven Basket DIY is FINISHED!!!! 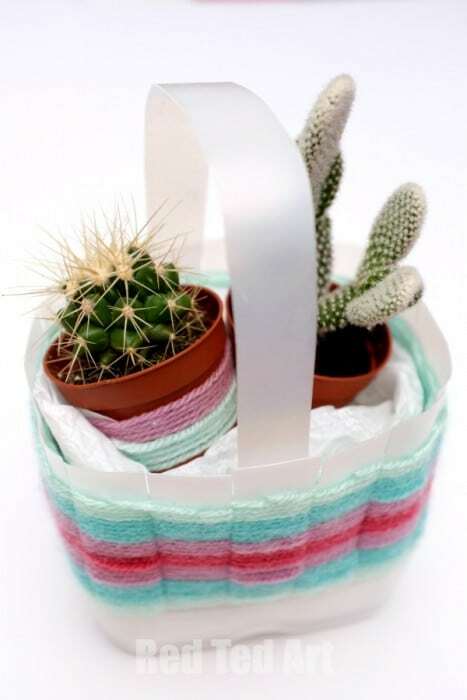 The basket is perfect for an Easter Egg hunt this Easter, or fill with flowers and treats for Mother’s Day.. we decided to go “non traditional” and fill it with these cute little Cacti!! Lovely lovely indeed. Happy Weaving and Happy Easter! This is lovely! I’m definitely going to have a go at this. My 4 year old is desperate to do any sort of crafts and since I knit and crochet would be delighted to use wool. Oh wonderful! I do hope you have fun. 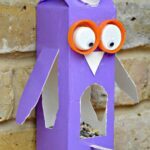 I find they still find it a bit tricky, but it is a great way to get them started! 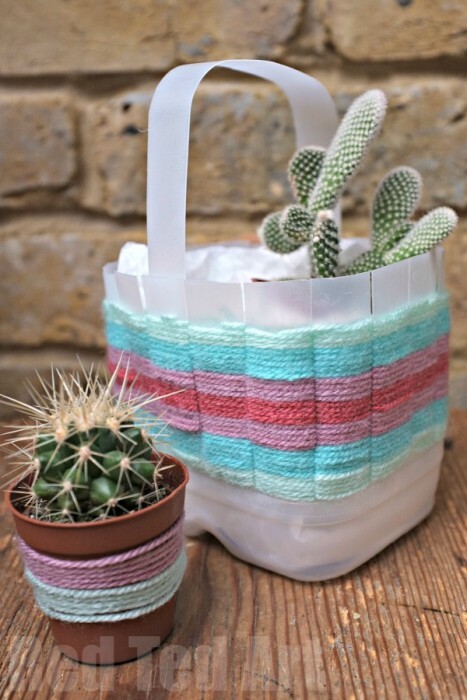 I’ve been wanting to try a bit of weaving with the kids… This looks like a challenge my daughter would love! And I bet the grandma’s would love it as a Mother’s Day gift! Oh I am sure that Grandma would LOVE it! !